I have an idea for all you summertime book worms. In addition to the trendy novels and biographies you plan to stick in your beach bag, why not insert a book on how to do better than most stock market investors? Or a book on how to sound like a seasoned supply-sider when the conversation turns to economics? If you’re interested, my good friend Victor Canto has written a book that covers both of these topics. It’s called Cocktail Economics: Discovering Investment Truths from Everyday Conversations (Financial Times Press, 336 pp.). 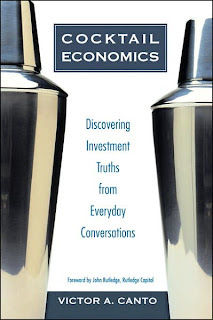 The title promises easy entry into what can be intimidating material: economics and investing. On this front, the book does not disappoint. But it offers so very much more. Back in the late 1970s, Victor had a problem. He was just out of the University of Chicago — where he studied, no less, with Milton Friedman and Arthur Laffer — and he was teaching his first class at the University of Southern California. His subject was economic theory, and he was to teach it to budding MBAs. So far, so good. But there was a problem: Victor’s students didn’t see what economics had to do with their careers. The better economists understand that making money in business or the stock market is directly tied to a person’s knowledge of the big-picture macroeconomic environment. Supply-siders, like Victor and myself, call this a top-down worldview, whereby a large policy “shock” occurs at the top of the economic food chain, after which it wields enormous influence on the broad economy, including the businesses that operate in the economy. But for Victor to convince his students of the importance of this process, abstract textbooks and traditional course outlines just wouldn’t do. More important, if he was to survive his first teaching engagement, he had to develop a hook. Young Professor Canto told his students that rather than work from the textbook each class, they would investigate the Wall Street Journal’s editorial page. Specifically, if an editorial discussed a new policy action in Washington, they would ask a few basic questions: Would the action impact the whole country, or just a pocket of the country? Would it play more on the supply or demand side of the market? How would the economy return to equilibrium in the wake of the action? And finally, who in business and society would be the winners and losers following each policy shock? It was this last question that hooked his students, all of whom wanted to be winners in life. Indeed, if they could answer this question correctly, they would be empowered. With economic truth on their side — truth that, not coincidentally, is the basis for supply-side economics — they just might win an argument at a cocktail party. (Hence, “cocktail” economics.) And if they applied this information to their investment portfolios, they stood to make a few bucks. This is what gives this important book its practicality. Winning arguments about the economy can be thrilling — I happen to love the sport. But being able to take supply-side truths to your broker can be much more satisfying. A policy action occurs in Washington — say a tax cut, a series of rate hikes from the Federal Reserve, or a regulation that slams into a handful of industry sectors. Any of these events can set a world of macroeconomic indicators in motion: industry output increases or decreases; profits rise or fall; jobs swell or swoon; GDP expands or contracts. But something else occurs in tandem with these events: Distinct asset groups respond accordingly and predictably. Identifying these asset-class responses — for instance, a spike in large-cap stocks, or a dip in bond-market returns — is critical for any stock market investor interested in superior performance. I talk a lot about the investor class and how it has become such a formidable force in politics. To join this class all you need is a 401(k) or a portfolio of index funds that you hold for the long-term. But as Victor makes clear, adjusting your long-term investments periodically based on the policy shocks that lead to major macroeconomic shifts is a proven money maker. In fact, skipping these periodic adjustments is the equivalent of throwing money away. And there’s no need to do that if you can perform some very basic functions, such as reading the newspapers and keeping your eyes open. Want to have a productive summer while you work on your tan? Read Cocktail Economics. It educates and entertains (there is no shortage of anecdotes and real-world examples) while offering simple-to-follow instructions on how to do better than the average investor. It’s also an excellent primer on how to argue like a supply-sider — which is not a bad thing if you like winning arguments.